It's come to this for Vince Young. Constables came to his home in Houston earlier this week to take inventory of his possessions. Most of his stuff will be sold at a sheriff's sale because Young still has an outstanding debt on a high-interest loan he took out during the 2011 NFL lockout. Pro Player LLC, which issued Young a $1.9 million loan at a staggering 20 percent interest, obtained a judgment last summer that says Young still owes them $1.7 million. Young was cut by the Bills a month later and has been out of the NFL ever since. He sued his former agent and former financial planner for $5.5 million, claiming they forged his signature and used the money for themselves. But in a deposition last December, Young admitted he "probably" signed the loan documents, though he also claimed he never had access to the money. Ronnie Peoples, the former financial planner, said in his own deposition that Young used the loan to spend more than $300,000 on his own birthday party. Peoples, we hasten to add, is also suing Young. Did Vince Young Take Out A High-Interest Loan To Pay For His Own $300,000 Birthday Party? In the meantime, Young is legally on the hook for the loan. KHOU reported that Young can hang on to $60,000 in personal property, but that everything else must go toward his debt obligations. His attorneys tried to get a temporary restraining order to stop the constables, but that effort was denied by a judge. 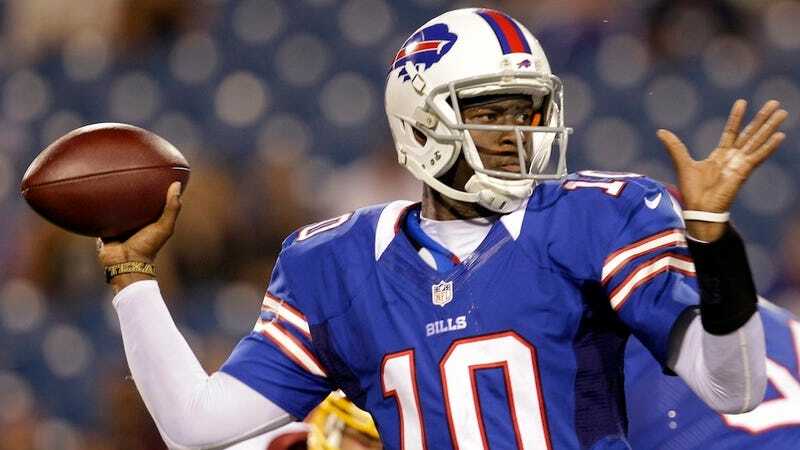 Vince Young is 30. He earned his degree from the University of Texas in May. Out in the world with a mountain of debt and zero job prospects in his chosen field, he's pretty much just another recent college graduate these days.